I got the idea for this costume after finding the orange rubber coveralls at a thrift store for 99 cents. The inspiration came from watching the Discovery Channel show "Deadliest Catch" about Alaskan crab fishermen. 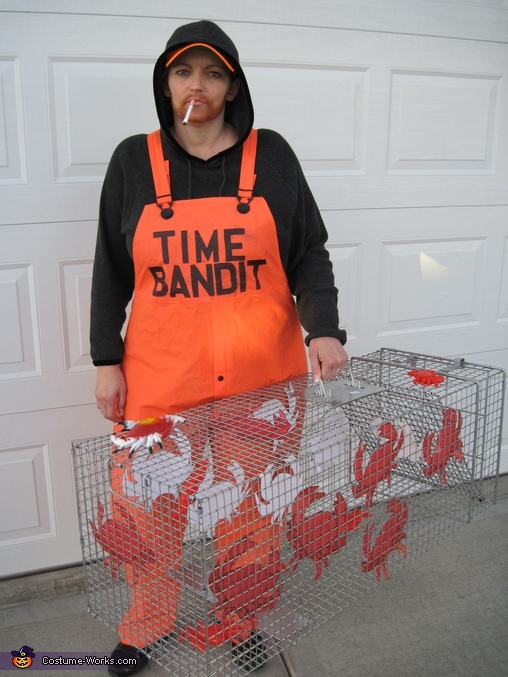 I used permanent marker & stencil to draw the name of the fishing vessel "Time Bandit" to the front of the coveralls. I pulled my hair back into a baseball cap & wore a black hooded sweatshirt that I already had on hand. I rolled up a piece of white paper to make a fake cigarette. I used brown halloween makeup as a beard that I applied with a cosmetic sponge. For the crab cage - I used a metal animal trap that we already had on hand. For the crabs inside I went online & looked up "crab coloring book pages" to find an image that I liked. I printed them out on red construction paper, cut them out & taped them inside the cage.